The location of our launch site is approximately four miles north of Dayton, 8/10 of a mile west of State Route 12 on Whetstone Road. 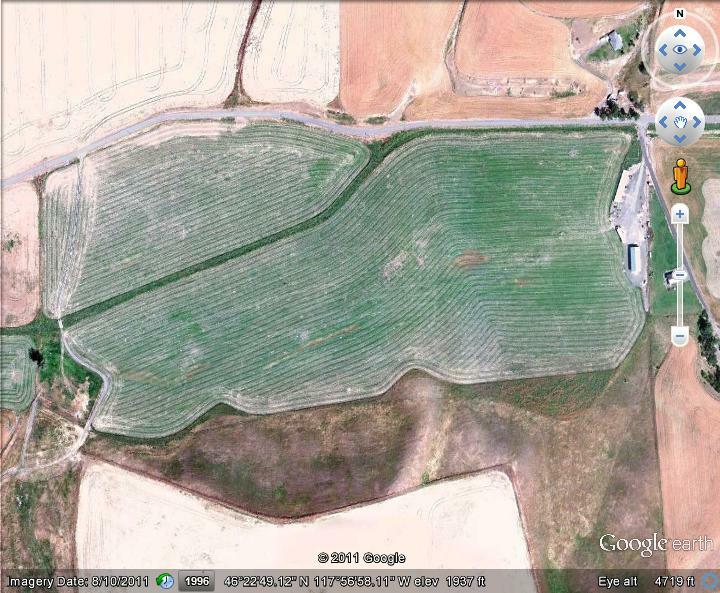 The launch site itself consists of a 66-acre alfalfa field, situated in a broad, flat valley. 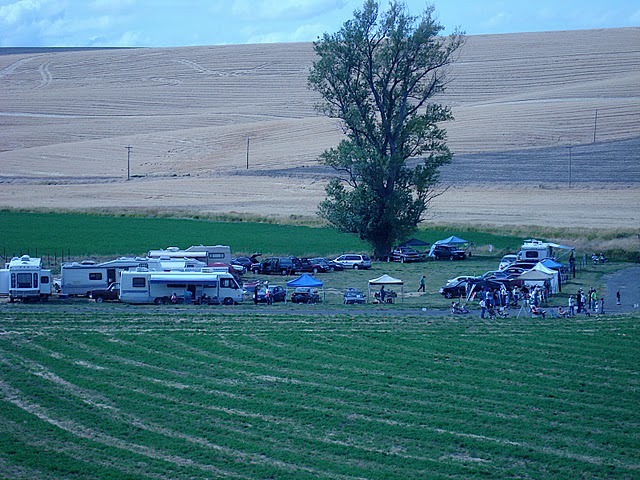 A corral planted in grass at the southwest corner of the launch site provides for dry camping and day use parking. camping and parking can be seen left center of the photo. with a ceiling of 5,000 feet AGL, fielding 32 pads supporting flights of "A" through "I" impulse. Due to land ownership issues at the east end of the launch area, we must limit the size and impulse of the rockets launched in an attempt to maintain recovery on the field. As a general rule, flights of "A" through "I" impulse are supported. Due to land ownership limitations surrounding our launch site, we must evaluate requests for larger flights on a case by case basis. Our on-site hobby vendor for the three-day launch events is Chehalis Junction Hobbies. Please contact our Board of Directors with all inquires regarding larger flights. "Sparky" motors are allowed at the March, April and May launches only. During these months, RSO's will evaluate each sparky motor flight on a case-by-case basis, based upon current field conditions and conditions of the surrounding area. All decisions of the RSO are final with regard to allowing or denying any rocket flight from the BMR launch site. A variety of stainless steel launch rods from three to six feet long up to 1/2 inch in diameter are available, as well as four, six and eight-foot long launch rails. NAR level one and two certifications and testing are available to eligible individuals. Hobby vendors are usually also on-site. However, please contact us ahead of time to verify their attendance. BMR has an open range policy charging no pad or event fees or membership dues, and welcomes all NAR, TRA , CAR and non-members to come participate in our monthly launches. All aspects of the National Association of Rocketry's Safety Codes are followed. Only commercially manufactured rocket motors certified by the National Association of Rocketry, the Tripoli Rocketry Association and the Canadian Association of Rocketry are allowed. No experimental motors are allowed. For rocketry enthusiasts who wish to spend the night in Dayton while attending our launches, the Best Western Plus hotel sits on a hill at the east end of Main Street overlooking the town. With 50 rooms/suites, indoor pool, excercise room, and free breakfast, the Best Western is a great place to stay. Call to make reservations at the Best Western by calling 1-800-780-7234. North Bound - Proceed north bound out of Dayton on State Route 12. 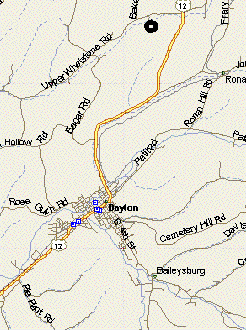 7/10 of a mile past mile post 372, you will come to a four-way intersection. Turn left (west) onto the gravel road marked "Whetstone Road". Proceed west bound on Whetstone Road for approximately 8/10 of a mile, turn left into the alfalfa field. You are there! South Bound - From Spokane, Deer Park, Lewiston, Clarkston and other points north or east, travel on State Route 12 towards Dayton. 3/10 of a mile past mile post 373, you will come to a four-way intersection. Turn right (west) onto the gravel road marked "Whetstone Road". Proceed west bound on Whetstone Road for approximately 8/10 of a mile, turn left into the alfalfa field. You are there!